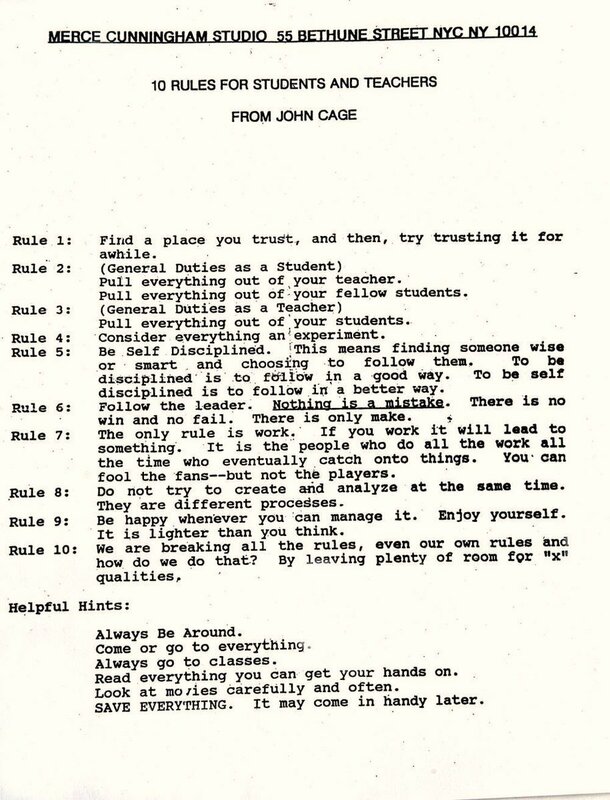 The Brian Eno archive More Dark than Shark recently posted on its Twitter account a list of twelve rules for students and teachers used by John Cage. Though much has been written about the artistic affinities between Eno and Cage, both of whose compositions have pushed the boundaries of how we think about music itself, they also both have a deep connection to the idea of using rules to enhance the experience of creation. Where Eno has his deck of creative process-enhancing Oblique Strategies cards, Cage had this list of rules first composed by an educator, silkscreen artist, and nun named Sister Corita Kent. Some of the rules on Kent's list, which has now exerted its influence for half a century, sound faintly like the Oblique Strategies Eno and the painter Peter Schmidt would come up with in the 1970s. Take rule number six, "Nothing is a mistake," which brings to mind the Oblique Strategy "Honor thy error as a hidden intention." But we're all on the same field when it comes to techniques to move our minds in worthwhile new directions, as Cage, Kent, Eno, Schmidt, and most other serious students, teachers, and creators might agree. They'd certainly agree that, all rules aside, everything ultimately comes down to doing the work itself, day in and day out. "Craft," as Eno once said," is what enables you to be successful when you're not inspired." Wonderful message, thank you. I will share it with my bright finance students where these rules are very appropriate. They can hardly hurt them. Unfortunately.